We normally refer to whistles as low whistles if there is one available an octave higher. 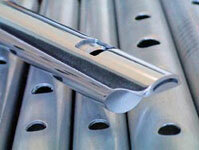 The G is the highest pitch commonly sold, so from G downwards we call the big ones Low whistles. 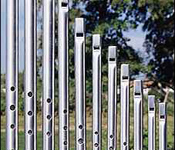 The Low Whistle, so popular today as a result of the success Riverdance, was first made in the early 1970s by Bernard Overton, from aluminium tube. The instrument is usually tuned to D, an octave below the usual small D penny whistle, and twice as long (more or less the same size as a flute).